The Descartes Labs Platform enables sharing of resources with access control lists. There are lists for readers, writers, and owners of most resources with specific prefixes for specifying others by group, organization or email. Most resources have three primary access control lists; readers, writers, and owners, each allowing a different set of actions. Each level is a superset of the others. readers are able to list and access individual resources. writers are able to modify individual resources and child resources. owners are able to delete resources and modify access controls for individual resources. You may notice the owners access control list has an organization identifier by default. 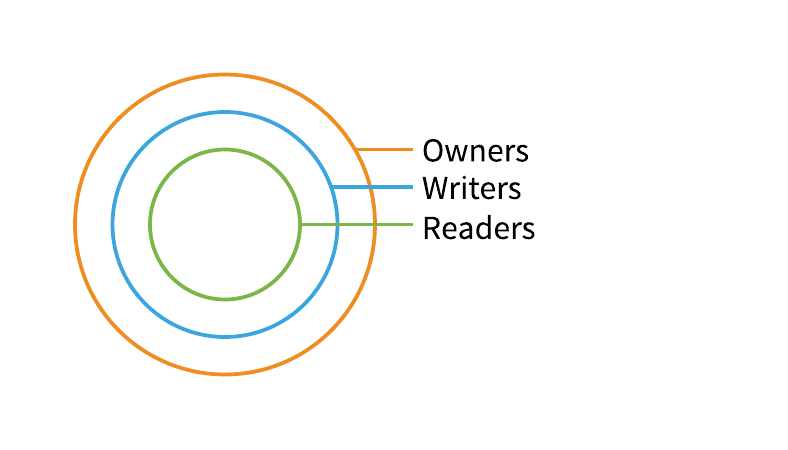 These organization identifiers have a different meaning than they do in the readers and writers lists. This is for future functionality to enable individuals with the organization admin role to manage resources across the organization. org:orgname - Organization membership is manually managed. Contact Support for assistance. group:groupname - Groups only apply within an organization.